The second week of the 2018 legislative short session opened more quietly than the first week with continued budget discussions behind the scenes as House and Senate leaders worked to agree on changes to the two-year budget enacted in 2017. Legislative leaders continued to slowly release more details about specific budget initiatives and provisions ahead of its full release, as they did last week with plans for teacher pay raises and economic development changes. This week’s budget highlights include school safety initiatives, a rural broadband grant program, and state employee raises. Legislators will likely release a budget early next week using Senate Bill 99 as a revamped vehicle and discuss it in a joint appropriations committee on Tuesday morning. It is likely the final product will move through both chambers as a conference report, which expedites the process but limits opportunities to change policies or adjust spending numbers since conference reports cannot be amended. Any budget bill would still go to the Governor for his consideration. While budget negotiations were ongoing, a handful of committees met this week to discuss issues affecting counties, including legislation that would accomplish a county priority this session: repealing the statutory authority that allows a local school board to file suit against a county board of commissioners over county appropriations for education. These provisions come on the heels of recommendations made by the House Select Committee on School Safety. That committee is set to continue its work during and after this 2018 legislative session, and legislators made it clear that the above budget provisions were just the first step the General Assembly is taking to make schools and students safer. Though early in the legislative session, several stand-alone bills focused on school safety have been filed. However, nearly all school safety related issues taken up this year are expected to be addressed and included in the budget. NCACC Priority Goal: Seek legislation to repeal the statutory authority under N.C. Gen. Stat. 115C-431(c) that allows local school boards to file suit against a county board of commissioners over county appropriations for education. This week, the Joint Legislative Program Evaluation Oversight Committee approved draft legislation based on the findings and recommendations of a study evaluating the process for resolving education funding disputes between boards of county commissioners and local boards of education. The previously released report on this issue is the result of legislation passed in 2016 directing legislative staff to study the issue, report its findings, and make policy recommendations. Committee approval of the draft legislation sets the stage for the legislation to be introduced and considered during the current legislative session. Repealing the statutory authority that allows a local school board to file suit against a county board of commissioners over county appropriations for education has been one of the NCACC’s top legislative priorities in recent years. During the 2017 legislative session, Senate Bill 531 as introduced accomplished that goal. That legislation passed the Senate with bill sponsor Sen. Tommy Tucker’s (R-Union) commitment not to move the bill in the House until the study was complete. For the first disputed budget year, appropriations would be the previous year’s expenditures for operating and capital expenses adjusted by changes in the projected average daily membership in the school district and changes in an employment cost index of salaries and wages for school personnel. The NCACC discussed counties’ continued concerns regarding how capital funding is treated under the legislation with co-chair of the Joint Legislative Program Evaluation Oversight Committee, and likely bill sponsor, Rep. Craig Horn (R-Union), and will continue to work with legislators to fine-tune this aspect of the bill as it makes its way through the legislative process over the coming weeks. The full report, including the recommendations of legislative staff and the official NCACC response to the report, can be found here, along with the committee presentation. NCACC Priority Goal: Seek legislation, funding and other efforts to expand digital infrastructure/broadband capability to the un-served and under-served areas of the state. Legislators released details on Thursday afternoon regarding a new $10 million grant program to help internet providers expand service to rural communities that lack access to broadband. The program, titled Growing Rural Economies with Access to Technology (GREAT), will likely be part of the budget. Under the GREAT program, utility and internet providers would be able to apply for grants for projects aimed at offering high-speed internet in sparsely populated parts of the state. The grants would cover 30-55% of the project cost, with providers covering the rest. Providers would have to prove there is sufficient need on the part of residents, businesses, and government entities, to support a program when applying for a grant. The GREAT program is a step toward addressing that challenge and part of the NCACC’s goal to seek legislation, funding, and other efforts to expand digital infrastructure/broadband capability to the unserved and under-served areas of the state. While this program doesn’t address the public-private partnerships that the NCACC is working toward, additional funding at all levels of government is a critical component in expanding access in rural counties. A proposed committee substitute (PCS) to Senate Bill 486 was released Tuesday night. The PCS was the only bill scheduled to be heard in the House Elections committee on Thursday, which was cancelled. The legislation included an extension on the decertification of certain voting equipment to December 1, 2019. The legislation would extend the deadline for counties to comply with voting equipment requirements established in 2017, which were passed before the current State Board of Elections and Ethics Enforcement (SBEEE) was appointed. The bill also includes provisions for elections security as recommended by the SBEEE. One provision would require criminal background checks for all state board employees as well as all county board of elections employees. While securing elections equipment and materials is critical, the costs and administrative burden associated with these checks would represent an unfunded mandate to counties. The NCACC heard from several counties that share these concerns and will continue to advocate for the resources required to meet state mandates. Following discussions throughout the interim in reconvened sessions and oversight committees, legislative leaders in both chambers introduced legislation addressing the GenX water contamination issue. House Bill 972 and Senate Bill 724, both titled Water Safety Act, would increase oversight over certain emerging contaminants including GenX. The bill gives the state authority to order a pollutant discharger to cease all activities that result in the production of a pollutant under certain circumstances. The state could also order the discharger to provide a water supply to affected water wells. Both bills provide funding for positions, equipment, sampling, testing and oversight to the NC Dept. of Environmental Quality (NCDEQ), NC Dept. of Health and Human Services, Cape Fear Public Utility Authority, and the NC Policy Collaboratory at UNC-Chapel Hill. The bills would also require any pollution discharge permit holders to submit a list of pollutants to NCDEQ identified at the time of their permit application. The House bill was referred to the House Environment and Appropriations committees. The Senate bill was referred to Senate Rules. Given the appropriations in the bills, they could be rolled into this year’s budget. County Assembly Day is May 30! 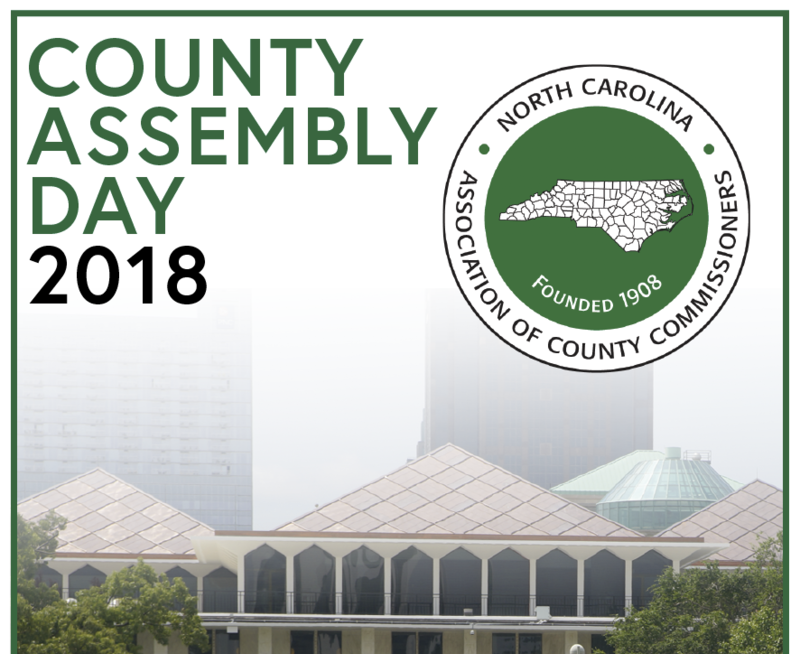 The NCACC will host its 2018 County Assembly Day at the North Carolina Museum of History in downtown Raleigh. A brief program in the morning will be held at the museum, which is directly across Jones Street from the General Assembly. NCACC will also host a lunch outside the legislative complex.